I have had a stressful work week -- I'm in week 7 of a training class for my new job, and I have to take a state certification exam tomorrow. So of course I put aside everything else I was working on and started something new. 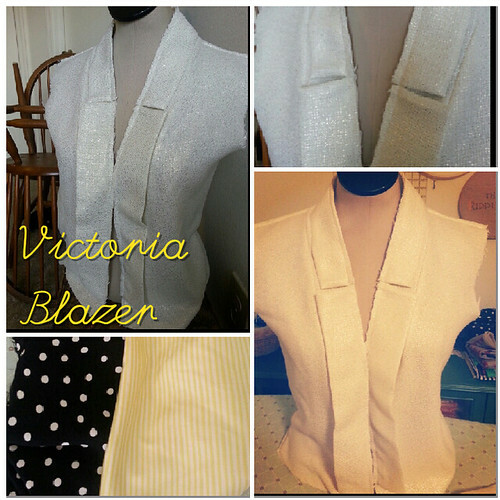 Enter the Victoria Blazer from By Hand London. I bought the pattern last month and then waited (most impatiently I might add) two weeks for it to arrive. And oh man is the pattern packaging awesome. I will make sure to take a picture for the post with my completed jacket. I'm using this unknown fabric that I picked up at my local fabric shop for a glorious $5/yard. Its an off-white with a golden metallic sheen. I wish I knew what type of fabric it was though...its got a pretty open waffleish weave that my stitches just sink into. And I thought it was going to be scratchy, but its not at all. It is very clingy though. The bottom left portion of the photo shows the black polka dot lining that I was going to use until I realized that it would show through the shell. So I'm using a yellow and white striped silk instead. The pattern only calls for lining in the body of the jacket, but I plan to line the sleeves too, since the shell fabric is so clingy. There has only been one difficult part so far and that was just due to a vague piece of instructions, so if you want a jacket pattern then I would absolutely recommend this. I'll explain more about the difficult part when I get some pictures of that step so it will hopefully clear some things up for others! I can't wait to finish and wear the jacket. And then make like 17 more in fun, funky prints!